Our bespoke polished concrete can be formed into almost any shape and with a range of colours. We can inset anything from recycled glass chips and decorative stone to metal objects which can be polished up to a lustrous finish. We can acid-etch the surface to leave a subtle imprint or to give a stone-effect. A bartop could have the logo etched into the surface. We can set in LED lights and fibre-optics or even a pop-up TV. There are literally an endless array of possibilities. A few of the features we can incorporate are mentioned above and that is why we offer a complete design service where requested. We have many years of experience working with concrete and with a background which includes product design and furniture design our team can produce designs and sketches from our small design studio at our premises in Penarth. 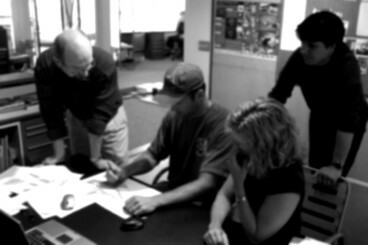 Our manufacturing process varies depending on the commission. With new bar and countertops for example, we can work from plans. 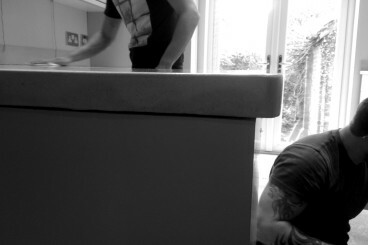 When replacing existing counters/work/bar-tops we can come to site and template from the existing. With furniture or sanitary products like basins, sinks, baths etc. we build the moulds from scratch using a variety of materials including polystyrene, moulding silicone and a number of textured items. From this we then build a perfect mould using high quality materials in our small factory. 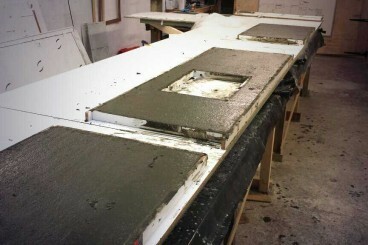 Using the mould we then cast the concrete products and allow them to cure in a controlled environment. Once cured we then remove the moulds from the concrete and perform the final stage of polishing and sealing. In all the process takes approximately 4 weeks. More often that not we give a completion date at the beginning of the project because we are totally confident in our working processes. We provide our clients with the option of pick up, delivery only and finally a delivery and installation service. If you as the client would like us to deliver and install, by the time we have finished the manufacturing process we will have already contacted you to arrange a delivery date. On the day of delivery, our team will arrive and install and in most cases this should take no more than a day. Once in place and secured we give the our handcrafted products a final polish where required ready for instant use.